1. 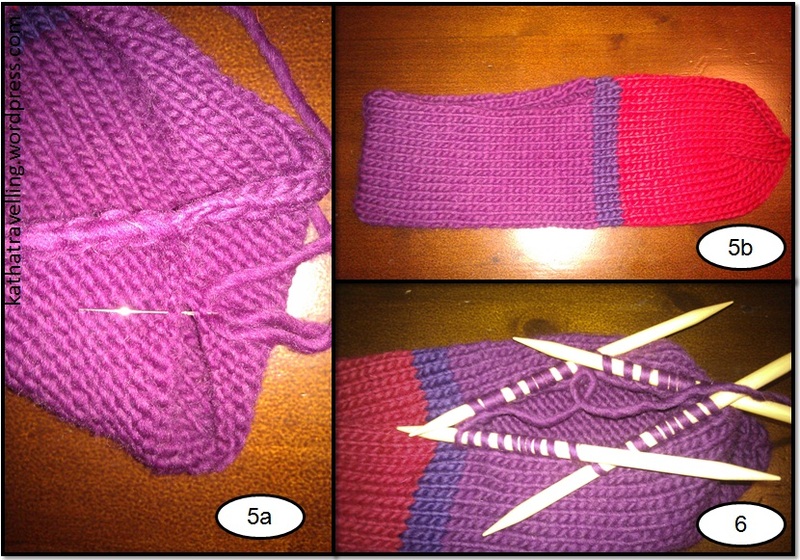 Start by casting on 34 stiches in berry and knit 34 rows in stockinette stitch. 2. In row 35, increase by one stiches on either side between stiches one and two and stiches 33 and 34 and set the stiches equally on four double point needles. 3. Now start with purple yarn and close the knitting now knitting in rounds. Change the colour from purple to red after 4 rounds. 4. After 16 more rounds you start to decrease the amount of stiches by knitting two together at the end of each needle until you have 2 stiches per needle left. Cut the yarn now and pull it through the eight stiches left and pull them together. This the toes part of your slipper. 5. Now sew the seam for the heel. Having done that that would be a slipper without a high ankle part. 6. To add the higher ankle part pick up 40 stiches in berry around the upper edge of the slipper starting from where the slipper has been knitted in rounds and set the stiches equally on four double point needles. 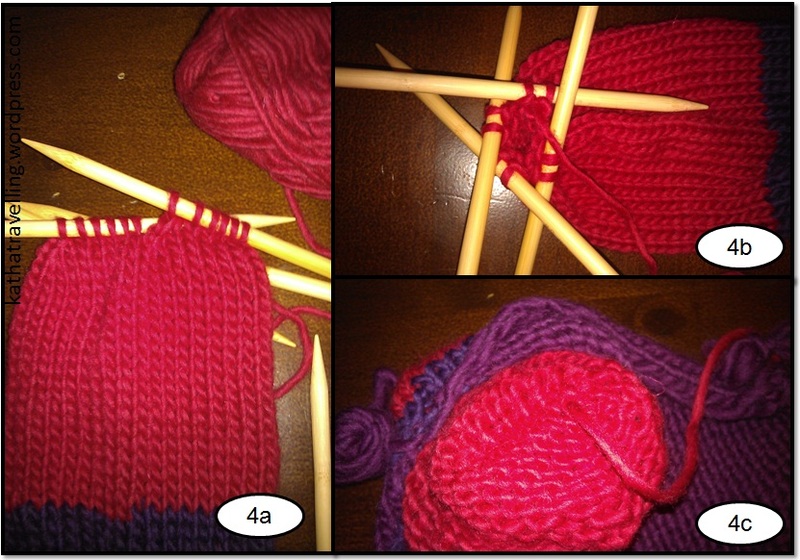 Knit 7 rounds in berry than change to purple, increase by 4 stiches, increasing the amount of stiches per needle by one. Then go on for8 rounds. Change to orange and knit another 4 rounds. 7. Now it is time to open up. Instead of knitting rounds, you now start to knit back and forth starting on your starting point for the rounds. 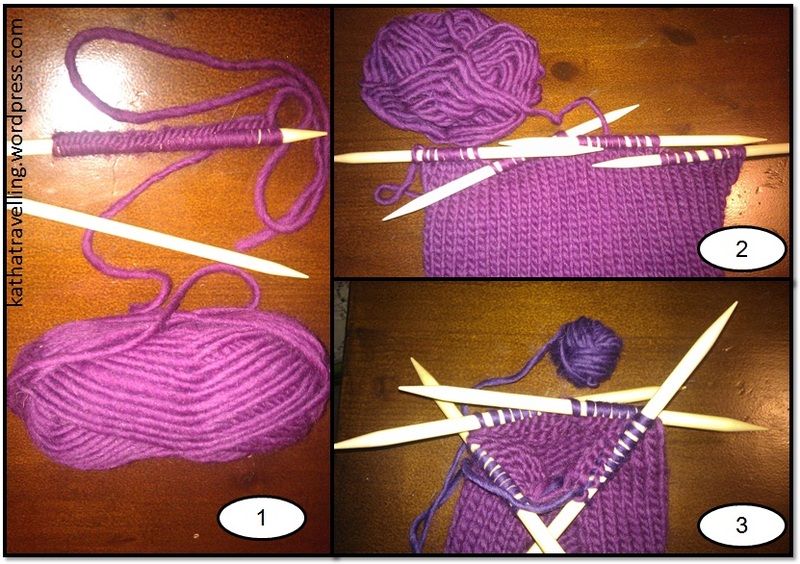 Knit another 17 rows than change to purple again for 4 rounds and bind the stiches of. 8. Now the slippers only have to go in the washing machine. Wash them at 40°-60°C. If you have some towels that need washing too, they make good washing companions. 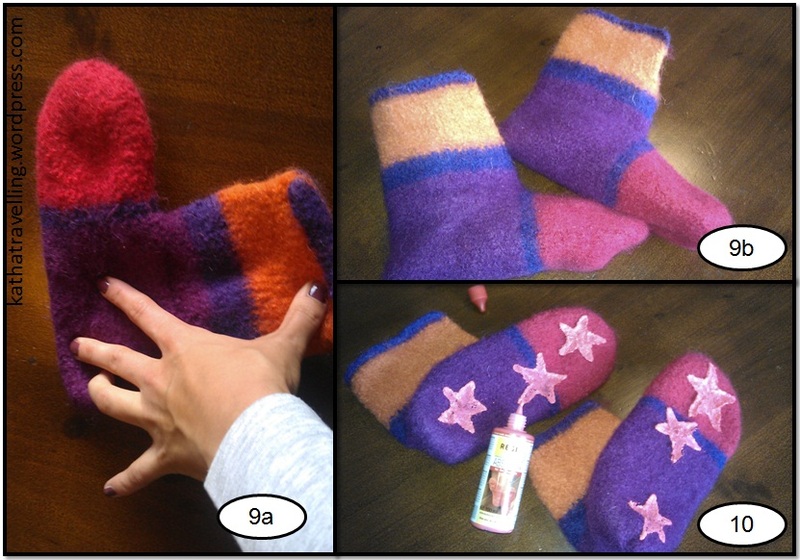 If you have, also throw in some dryer or laundry balls to increase the felting. 9. 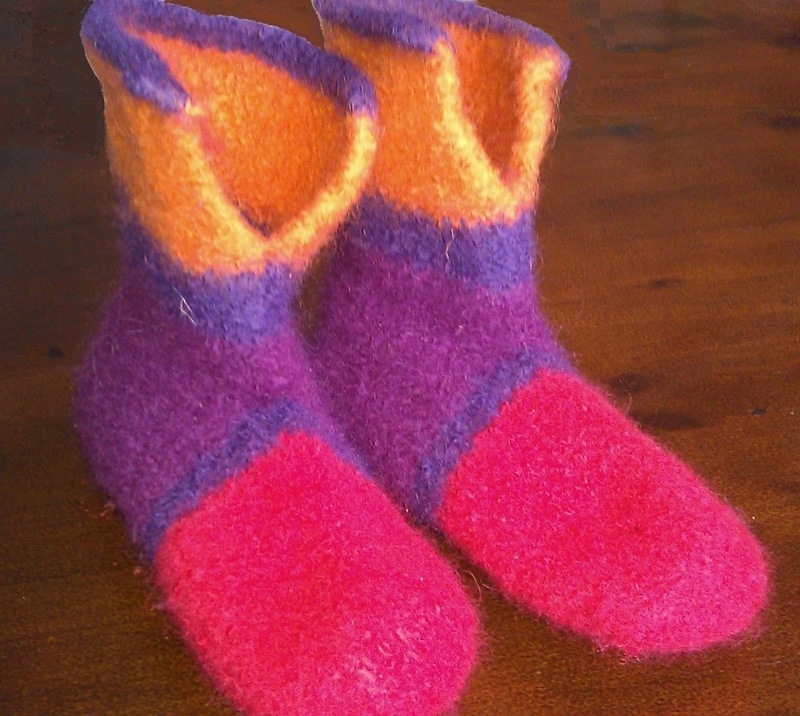 After felting, the slippers have to be streched to their actual size, having shrunken quite a lot (about 30%). Sizes after felting may vary. It is therefor always reccomendable to have someone with the shoe size you are trying to achieve trying on the felted slippers after you have streched them to make sure they really fit. 10. The slippers need about 24h of drying. Then you can paint stripes or what ever forms you like with anti slip silicone ink on the soles of the slippers. This needs another 12-24h hours of drying and then your shoes are ready to keep your feet warm during the colder days. I hope you enjoyed this tutorial and I willl gladly answer any questions you might have. Just leave a comment and I will get back to you. 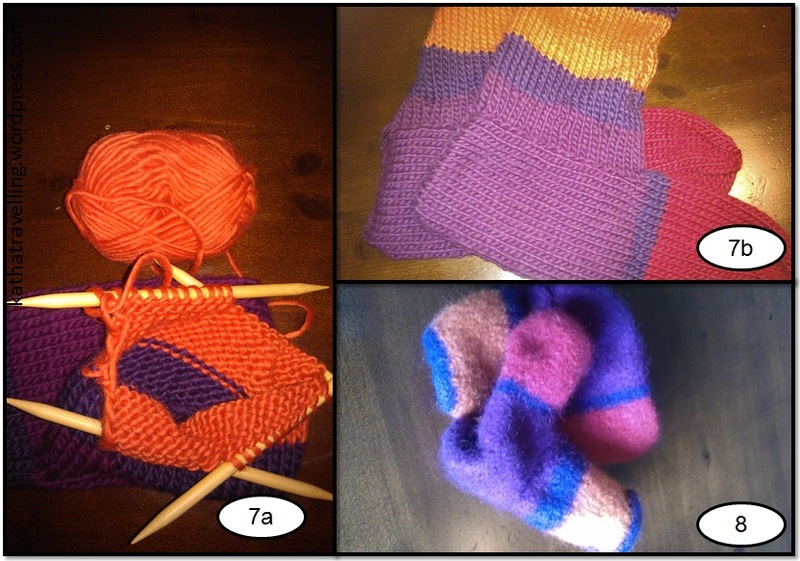 This entry was posted in Knitting & Crocheting and tagged Knitting, Pattern, Slippers, Tutorial by kathatravelling. Bookmark the permalink.